Mid-Autumn has passed and a new season is here – auction season. Right now in Hong Kong, art buyers and lovers can shop for everything from paintings to antiques to sculptures. But there’s a gap in most catalogues: urban art. French auction house Artcurial is looking fill that space by bringing a wide range of European street art and historic comics to Hong Kong for sale and display. Flying in artwork all the way from France, the aptly named auctioning exhibition From Paris to Hong Kong is showcasing 130 unique artworks. The associate director of Artcurial, Isabelle Bresset, is here hoping to shine a spotlight on a genre that Hong Kong’s art market is not entirely familiar with. “Hong Kong has become an international art centre but you always have to make [the art scene] stronger in a city,” she tells us. “Street art is one way to make it more visible.” The Paris-based auction house is famous for its urban art department and after a successful debut in our city last year, Bresset and her team are back to celebrate the 10th anniversary of the Paris department’s establishment with this new exhibition. “People are coming to Hong Kong from Asia and every part of the world during the auction season. It’s going to be interesting for Hongkongers and international viewers to see different art objects,” Bresset remarks. dense lines and geometric shapes; and graffiti artist Invader’s artworks are well known for being based on the pixel graphics of old video games. Aside from street art, this on-sale exhibition also focuses on historic comics. Anyone who grew up reading the adventures of Tintin or enjoyed the recent film adaptation in 2011 can get the chance to view and handle original comics and artworks by the series’ creator, Hergé, dating back to the 1930s. 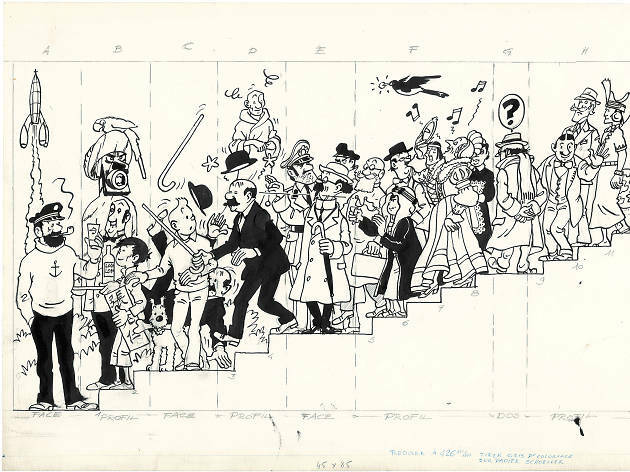 One such artwork is a rare paper sketch made in 1979 for the fresco decorating the main stairway at the Cultural Center of Wallonie-Bruxelles in Paris. 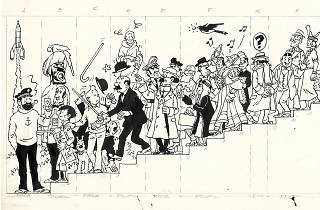 The one-of-a-kind sketch, which Bresset expects will fetch a high price, is one of Hergé’s few works to feature every popular character that appeared in the Tintin series. Other comic rarities to look out for include French comic book artist Olivier Ledroit’s drawings, which favour a gothic fantasy style, as well Moebius’ Harzach series, where he creates entire new worlds through beautifully detailed illustrations.